In addition to describing the installation of the tunnel, we would like to explain how we set up fences to guide amphibians to the tunnel entrances. There are lots of different types of fencing materials to choose from: cement, wood, metal, plastic mesh, PVC or Big O pipe cut in half, landscape cloth, etc. 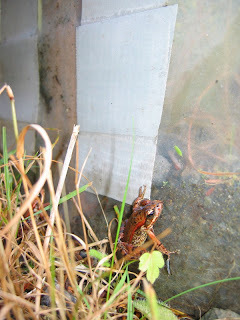 ACO Systems Ltd even makes a specially designed fence product for amphibians (http://www.acousa.com/wildlife/index.htm). For now, we decided to stick with the clear plastic sheeting (6-mil polyethylene) that we have used for roadside barriers. 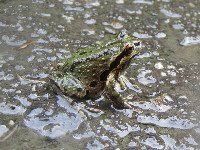 We knew it would successfully block Red-legged Frogs, Northwestern Salamanders, Rough-skinned Newts and Western Red-backed Salamanders. Pacific Treefrogs can climb over it, but they seem to be able to climb everything! The clear 6-mil polyethylene lasts a long time in the shade (our roadside fences have lasted six years), and it’s inexpensive. We decided to keep our investment low until we see how well the new tunnel works. We cut pieces that were 50 cm tall and attached them to wooden stakes with duct tape and thumbtacks. We dug the lower edge of the plastic 10 cm under the soil so that salamanders and frogs could not burrow beneath it. 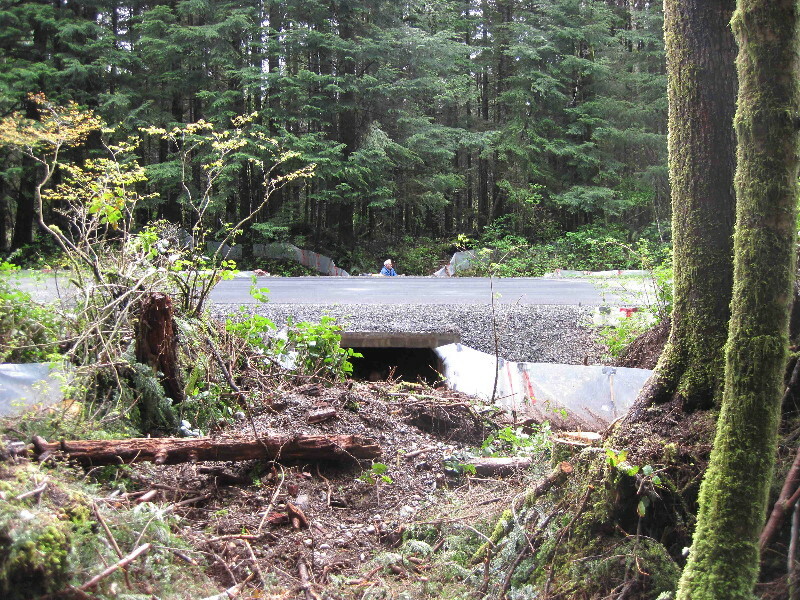 It is important to position fences on angles that direct animals toward the tunnel entrance, rather than placing them perpendicular to the direction that amphibians are travelling. We angled fencing at 20 to 45 degrees from the edge of the road into the forest for up to 60 m.
The topography was uneven so it was a challenge to keep the fence taut. 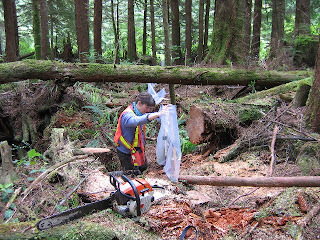 We chose the path of least resistance, but still needed to cut away a few logs and several small roots. We piled soil up on top of the plastic in places where we could not bury it under large roots. Connecting the plastic to the tunnel entrance was easy because the box culvert has straight vertical walls. It also helped to have a thick layer of dirt on the floor of the tunnel. We extended each plastic fence about 1 metre into the tunnel, dug it into the dirt, and held it against the wall and ceiling with wooden stakes and wire. This created a smooth transition from plastic to concrete wall. We are monitoring amphibian movements along the fences and through the tunnel this fall. Our next post will describe our monitoring techniques and some of the results to-date.